High performance PRO materials with an added zip in/out no-see-um mesh wall provides 360° of ventilation and bug protection. 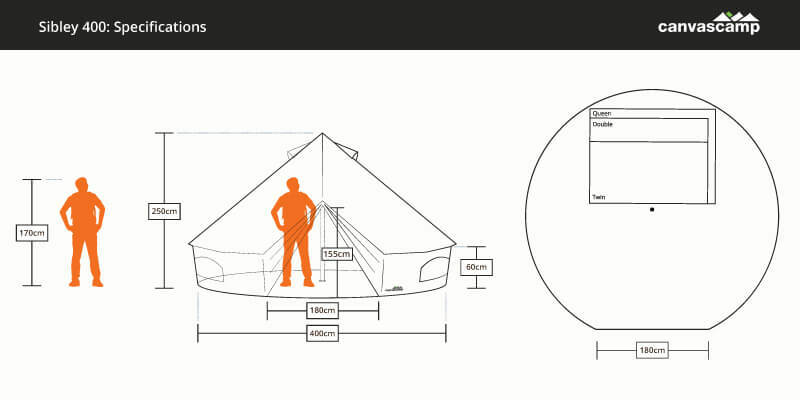 The Sibley 400 ProTech measures 4 meters (13ft 1in) in diameter with 12,5 m² (134 ft²) of floor space: great for 2-4 adults. Water, mold and UV resistance won’t impede breathability in our PRO canvas (360 gr/m² or 10.62 oz/yd²). 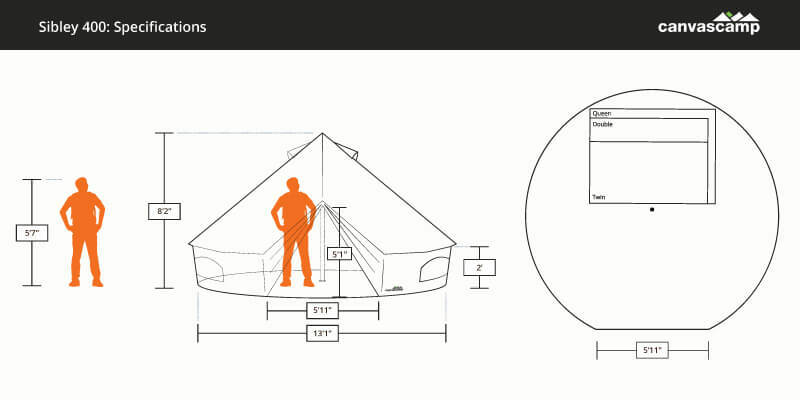 Zip in/out bathtub style groundsheet with rip-stop technology keeps even standing water out. Roll up side walls, mesh backed windows and vents, matching canvas carry bags, are just a few of the ProTech’s full suite of features. Repairable, retreatable, and sustainable: the ProTech is top of the line. The SIBLEY 400 PROTECH is ideal for 2 glampers on a full mattress or as many as 4 campers on sleeping pads. Canvas bell tents are not for use with open fire pits. Fire safety is the responsibility of the user. We encourage you to educate yourself and practice vigilant fire safety. Read our FAQ and blogs to learn more about fire safety. Do not hesitate to contact us if you have any questions or concerns at any time. Always check local fire restrictions prior to starting a fire as rules and regulations may change frequently throughout the year. Aussie Survivor cannot be held liable for any damage or injury to persons or property resulting from the use or misuse of fire or flammable materials in or around our tents.